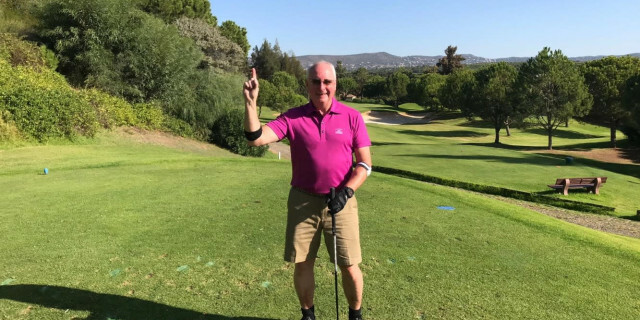 John Paton, from Dunblane, was enjoying a golf break to Portugal with seven school friends, when the 62-year-old holed out on the second at Pinheiros Altos' Corks to secure a trip to the 2020 Ryder Cup through the Million Dollar Hole in One (MDHIO) Challenge. MDHIO's popular par-three challenge allows competitors to win a selection of golf-related prizes: from balls to pitch-mark repairers for landing on the green, while a hole-in-one at one of the 40 associated courses across Europe earns a once-in-a-lifetime trip and the chance to shoot for a $1m jackpot. The 24-handicapper's maiden ace came on the 154-yard, par-three hole, as Paton, an accountant, explained: "We'd played at Vale do Lobo earlier in the week and we'd all paid our €10 to play there without much success. I was the only one to do it at Pinheiros Altos, because I thought I could do with a new glove or some more balls - I'd lost quite a few. "I hit a hybrid. It wasn't a particularly good shot, it didn't go high, but it was straight, and landed about 20m short of the green, bounced two or three times and just rolled up. I thought I might be on for some balls, but it kept on rolling. My friends were starting to get excited, because we could see it all the way. It was like it was in slow motion, it was surreal. I was just hoping it would stay on the green, but it rolled straight up to the cup and in. "I was dumbfounded as I'm not really a regular golfer. It was marvellous; my mates were all going crazy. A lot of it is luck, so on a par-three it's worth taking part." Paton is now looking forward to a trip to the 2020 Ryder Cup, at Whistling Straits, Wisconsin, and the $1m shootout. He added: "It's quite exciting, certainly different. It's not the sort of thing that comes along very often, if ever." MDHIO, which has been running since 1990 in the USA and since 2000 in Europe, has steadily grown in popularity with more than 50,000 people each year trying their luck at various par-three holes at courses across Portugal, mainland Spain, Mallorca and the UK. Nearly 60 golfers have achieved their ace while playing MDHIO in Europe, while more than twice that number missed out by not entering and, subsequently, acing the hole.